Robert Stevenson triumphed over his initial lack of learning to become one of the most famous of all lighthouse engineers. 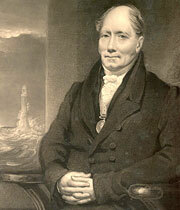 His name is synonymous in the public mind with Bell Rock Lighthouse — constructed between 1807 and 1811, with significant input from John Rennie Snr. 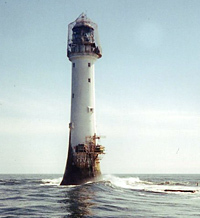 Stevenson overcame the considerable practical difficulties of constructing it, on a tidal reef far from land, and both men took much inspiration from John Smeaton's earlier work, Eddystone Lighthouse. Shrewd, ambitious and hard-working, Stevenson set his standards high and expected everyone he worked with — including himself — to reach them. He set up a multi-disciplinary engineering firm that would operate continuously until the mid 20th century, and he mentored a large number of young engineers and apprentices. Though he is remembered chiefly for his Scottish lighthouses and establishing the Northern Lighthouse Board service, Stevenson also made important contributions to maritime and river navigation engineering, and canal, railways and highway infrastructure. Significant examples include major bridges in Edinburgh, Stirling and Glasgow, improvements to the Tay navigation and the cycloidal curve profile sea wall at Trinity near Edinburgh. He was very interested in coastal erosion, and he invented the 'hydrophore', an instrument for measuring water temperature at different depths. Robert Stevenson was the founder of the Stevenson dynasty of engineers, collectively responsible for numerous lighthouses and other civil engineering works, in public and private capacities over nearly 150 years, through four generations. The famous Scottish author, Robert Louis Stevenson (1850-94), was his grandson, born four months after the engineer's death. Robert Louis trained as an engineer for a time but his talents lay elsewhere — he is known to readers worldwide for such works as Treasure Island.